Volkswagen Passat 2.0 TDI S 5dr 2019 Review | What Car? What Car? will save you at least £5,889, but our approved dealers could save you even more. 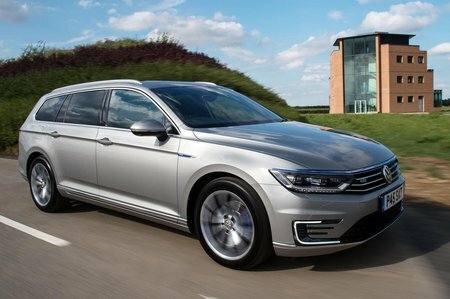 The VW Passat GTE is spacious and refined and has a 31-mile electric-only range. It's a great option for company car users. Includes air-con, 16in alloy wheels, a multi-function steering wheel, colour touch-screen, digital radio, Bluetooth and a USB input, but it’s still worth the extra needed to jump up to more lavishly equipped SE. Our pick of the range in manual guise, this engine is punchy and flexible enough to offer easy overtaking when you want it, and is low-revving and quiet enough at a motorway cruise. Avoid the six-speed automatic gearbox if you can – it’s an older 'box than the seven-speed auto in other Passats and is a bit slow to respond at times and doesn’t help fuel economy. Also available in the jacked-up, four-wheel-drive Alltrack model, as a manual only; well worth considering given that it's remarkably capable off-road, while also being classier and bigger inside than most of the SUVs it competes with.